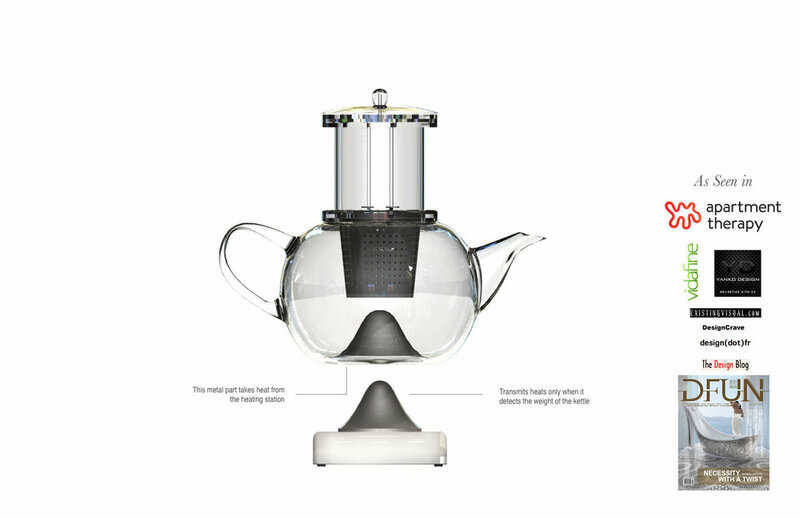 FALL tea brewing system is a portable tea brewing system designed to offer convenience of use while promoting the rediscovery and appreciation of the anti-fast food and aesthetic pleasures of a more traditional approach to tea brewing and drinking. The system consists of the kettle, the sliding tea strainer, the tea strainer holder, the lockable lid and the brewing station. The simple locking system and the sliding tea strainer can be withdrawn from the hot water easily at any point during the brewing process. This not only allows the user to determine the strength of the tea, but also eliminates the need to fully remove the dripping leaves from the kettle; thus reducing mess and the unattractive presence of this by-product of the tea brewing experience. The transparency of the body of the kettle permits the user to see the strength of tea and enjoy the changing color of the water as well. Since the heating element, at the bottom of the kettle, is concave it can be placed on any flat surface without damage it. The lack of an obvious “decorative element” to FALL tea brewing system, is the point of its aesthetic design. It is not the kettle itself, considered simply as a household object, but the changing colors of the water and motion of the tea leaves within that presents its visual beauty to the user during the brewing process. The paradox of this transparency of the FALL kettle is that its visible-invisibility resists our tendency to ignore or take for granted the process by which such everyday objects fulfill our desires.